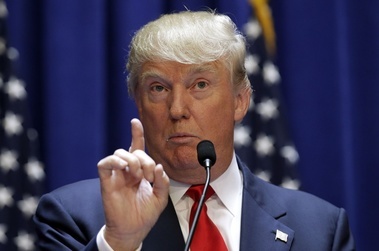 Trump points out another trademark of royalty: small, stumpy fingers! New York, NY In his latest press conference, Donald Trump outlined his plan to "Make America Great Again." It included plans to dismantle the U.S. government, including the Judicial, Executive, and Legislative Branches, and make him King. He explained how it would simplify government and how great it would be to have him King. Trump stated that he already had Trump Palace and pointed out how the Royal House of England has the Royal Warrant Holders and he had-Trump Steaks! Trump also postulated that the scientific community would want to figure out a way to make him immortal in order to solve all succession problems. "This is how, as all my followers tell me all the time, that I can best make America great again!" trumpeted Trump.